Announcing another CelebriGum technological breakthrough! Presenting the first CelebriGum 3D image! To properly view this Tobey Maguire photo, put on the complimentary 3D glasses that were included with the special CelebriGum supplement in your Sunday newspaper. You didn't throw away the glasses, did you? 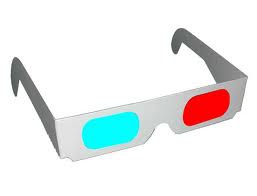 No worries -- thanks to another CelebriGum breakthrough, you can simulate the experience of having a pair of 3D glasses by viewing this photo. The 3D glasses for viewing the photo of the 3D glasses will be in this weekend's CelebriGum Sunday newspaper supplement. Please try not to lose them. Thanks! It was an interesting project to figure out how to make photos into "3D." Especially since I had to do it in about 20 minutes before leaving for work. Your 3D images made me nauseous and I vomited on my laptop. I hope you're happy Celebrigum. Again, no worries! This Sunday's CelebriGum newspaper supplement also includes a coupon for a new laptop computer. Watch for it! No problem, I just got my scissors and cut out the glasses from my computer screen! Oh, wait... I guess there is a problem. Scissors? Guess somebody's doing pretty well out there in Hollywood! I even splurged and bought the left-handed kind! Very clever! and highly entertaining! Can't help but be impressed by your creativity, exhibited for us over and over again. Thanks for sharing with us.